Occasionally when working on one thing long enough, you discover something unexpected that allows you to take a step forward in understanding. At the ICCC conference, I met Steve McIntyre and took time to ask him how come Mann07 “Robustness of proxy-based climate field reconstruction methods” didn’t show any variance loss in the historic signal. The paper makes the claim that CPS is a functional method for signal extraction, which I’ve long and vociferously contested 😉 . Neither of us had a good answer, but I had to know. In Mann07 – Part II at the Air Vent, the mystery was solved. The M07 paper uses model data as a ‘known’ temperature signal and adds various levels of noise to it. While the work oddly uses white noise in most operational tests, it does present the example of ARMA (1,0,0) ρ = 0.32 models, and it showed very little variance loss. 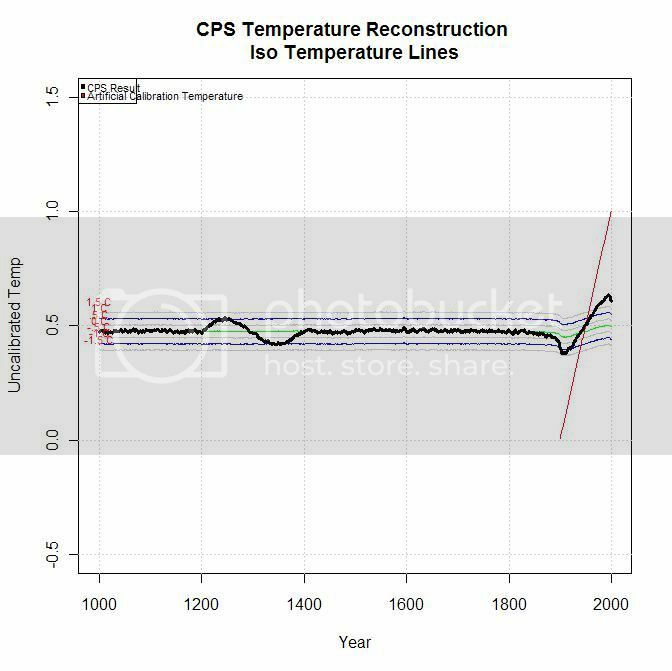 Replicating M07 using CPS wasn’t difficult and the results were confirmed – no historic variance loss so no artificially flat handles for the Mann hockeystick. 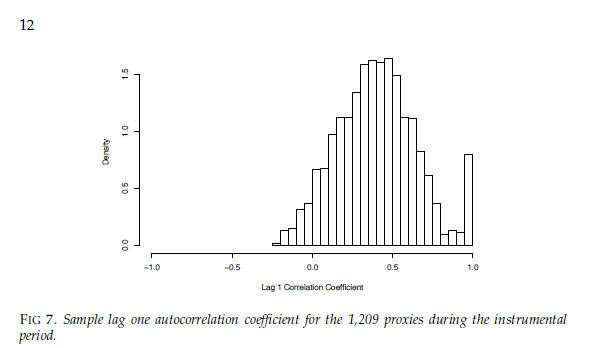 By adjusting the SNR of the pseudo proxies and rerunning the code, I came to a result of a SNR of 0.085 or 8.5 percent amplitude signal to match the 40 percent proxy retention of M08 at a correlation of 0.1. Put another way, this is about 12 to 1 noise to signal as compared with Mann07’s allegedly ‘conservative’ estimate of 40 percent signal to noise or 2.5 to 1 noise to signal. Not really very close. Added per request by Richard Telford. This entry was posted on August 19, 2010 at 8:21 am	and is filed under Uncategorized. You can follow any responses to this entry through the RSS 2.0 feed. You can leave a response, or trackback from your own site. Nice point on infilling and Luterbacher. And we haven’t even examined the linearization assumption in tree-rings, perhaps other proxies as well. I think they need to go back to first botanical principles and start over. Without good physical reasoning, I don’t think reconstructions are going to pass. It’s never easy to tell what people will want to comment on. This was one of my favorite posts lately but it has about 200 views already and only one comment. I thought a math demonstration that there is basically zero signal in proxies was pretty exciting. haha. Don’t worry about the lack of early comments. People need to download some of your code and run the script first before they can have something cogent to say. Um, I hate to point out the obvious but an SNR of 1 is not “no noise,” an SNR of 1 is equal parts noise and signal. If there is no noise the SNR is infinite (x/0 == infinity for 0 < x < infinity). Did he really write this? If he used the SNR # anywhere his calculations are incorrect. #8 it looks like the infinity symbol didn’t copy right, it’s kind of wierd that it turned into a 1. Jeff, thanks for the mathematical proof for what many of us assumed from the beginning. How can tree rings be used as a proxy for warmth? Tree rings are representative of many local conditions so filtering for one is impossible. So don’t despair re: the comment numbers. We agree! It just didn’t take the math to confirm our beliefs. #10, It is the first time I’ve quantified the SNR in proxies, it was pretty cool in my view, but horribly unpopular for comments on two blogs. As I’ve continued messing with the code last night, it really is sinking in that the temp signal may in fact be demonstrably not there. What if you can prove that there is no discernible temperature signal in tree proxies? There should be some response to temp but maybe it’s so little as to be undetectable in tree ring widths. Didn’t a gent by the name of Viterbi advance the science of extracting useful signal from apparent noise? There’s more than just Viterbi: literally hundreds, if not thousands, of methods that are useful for extracting signals from noise. Viterbi is famous for uncovering an iterative way to determine the maximum likelihood estimation of a signal in noise (essentially). More particularly, the Viterbi algorithm was originally designed to decode convolutional codes in noisy communication links. From what I understand, he was not immediately aware that his algorithm boiled down to MLE until someone else pointed that fact out. He went on to found Linkabit and Qualcomm and is now, rightfully, probably a billionaire. Note that as with any other signal extraction algorithm, the distinction between “signal” and “noise” are typically required a priori. Otherwise, there is no way to know what you’ve actually extracted. Just because you have the ML (or MMSE or MAP) estimate from a set of signals does not mean they have any relation to a physical phenomena. To my knowledge, nobody has ever clearly defined either w.r.t. tree-rings. What if you can prove that there is no discernible temperature signal in tree proxies? I doubt it would be provable in a true sense, though possibly something that could be emperically demonstrable. My guess has always been that the divergence problem is precisely why you cannot trust such a “signal” to be there arbitrarily over time. REPLY: I didn’t miss your link, and will try to read it tomorrow. Papers typically take me a long time to absorb so if you want to make a point a few words are usually helpful. Jeff ID, I think you might get more responses if you make clear the transition of data and methods from Mann 2008 and 2007 and then clearly show what Mann used for proxy selection and what you used and any differences. 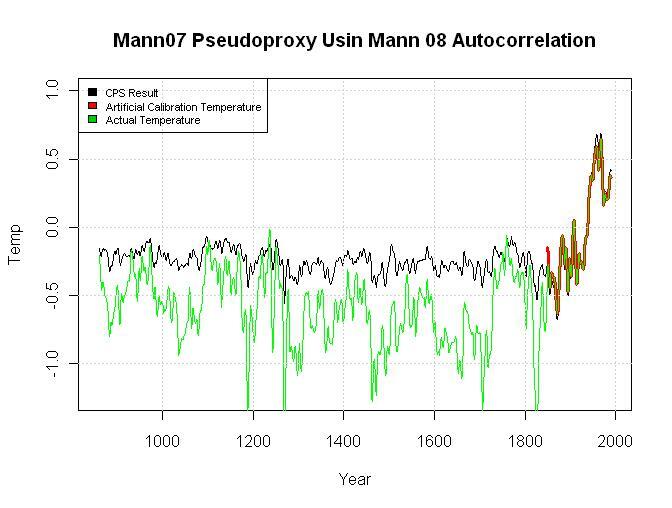 You have replicated the no variance attenuation that Mann found in Mann 2007 using his autocorrelation and SN values. It should be made clear where you disagree with Mann or where you are merely making calculations that Mann had ignored or not made. It is easy for me to get lost in these discussions unless I go back and comprehend the papers as well as the person writing about them. It appears that Mann 2007 somehow estimated a signal to noise ratio of 0.4 as somehow typical of the proxies in the reconstruction and I assume that is all red noise. 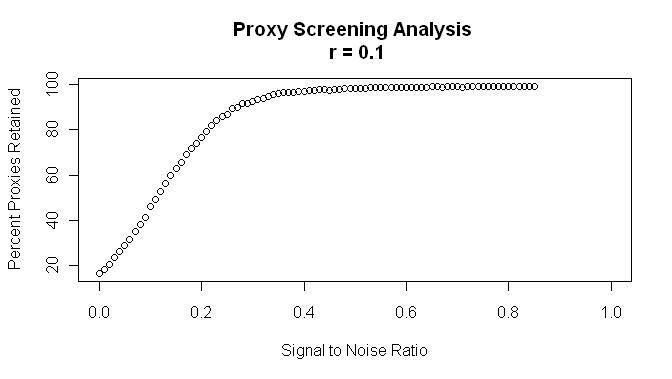 For the proxies used in Mann 2008 you obtain a much different SN ratio using a proxy selection criteria that is the same or different than Mann used? The upshot of your analysis would appear to me to be two fold in that a low signal to noise ratio, when that noise is red noise, will definitely attenuate the reconstruction variance and the estimation of Mann for SN ratio in Mann 2007 is critically different than what you found for the proxies in Mann 2008. #17, Thanks, I really saw this as a good step forward in understanding paleo reconstructions, which is why I offered it to CA. I think you must be right that some of the explanation is missing. It really was an exciting result to me, but for some reason it wasn’t communicated well enough. Perhaps a re-explanation is in order with basic points followed by the more complicated conclusions. I can’t yet find any errors in this post, and have tried several times because it is an extreme result. Richard Telford is a paleo guy who wasn’t convinced, didn’t like my R (rightfully so), yet didn’t identify any error either. Just as a tease to you, if I wrote it with a bit of emotion, I bet a hundred people would comment before the end of tomorrow :D.
It doesn’t matter for here but I wish it would have worked better for CA. There are a lot of math guys there which could have figured out what was going on, but probably didn’t spend the time. Good job Jeff. If it stands up, I don’t see why this wouldn’t be publishable. It wouldn’t have to be positioned as a rebuttal of Mann 07 or 08 – there are other angles. Duhhh – the instant I hit “send”, I realized that in information theory and data recovery, the signal being sought has a known structure, while the temp or ANY climate signal is most certainly NOT known. I was taking a random walk in the dark and I bumped into a tree with rings. I find this comment in your thread introduction could be confusing to some of us readers. Read as “With white noise or low autocorrelation noise, there will be no variance loss (HS handle) as reported in VonStorch and Zorita 04, Christiansen2010, McIntyre Mckitrick o5 or numerous other studies.” means something entirely different than “With white noise or low autocorrelation noise, there will be none of the variance loss (HS handle) as was reported in VonStorch and Zorita 04, Christiansen2010, McIntyre Mckitrick o5 or numerous other studies.” In the first case you are agreeing with the other authors and in the second you would be disagreeing with them. Also I thought that red noise was the topic of this post. This reminds me of times when I have a breakthrough to a big insight, and then expect folks to get it by walking them down my pathway to it. They are inevitably underwhelmed, if not baffled. Your headline did capture the message, but then you eschewed the traditional operatic overture, teasing the audience with a nifty medley of the upcoming themes. Instead, you cut directly to the arcane train of thought, that led to the conclusion, and even that is scarcely reiterated. I know, I know, repetition is insulting, but certain things are worth repeating. You’ve done the important synthesis work; now it is just a question of conveying the work product and explaining it in a ‘standalone’ approach. You’ve lost the ability to approach the breakthrough comprehension de novo , because you’ve already pre-loaded a lot of key stuff. So, go play with the kids, and take a break from the mental resonance. This is fine work. I anticipate comprehending it more fully when you are able to present it without assuming that the reader has equal grasp of the various Mann concepts as you now have. If I use a FARIMA model with ar=0.44, d=0.25 and ma=0, I get about 40% of the random series accepted at r=0.1, not 15%. If I add a real signal, the acceptance goes up. but the sine wave part of the signal gets seriously squished at low signal to noise. For this graph, the acceptance was about 45%. #23, That’s very interesting. It looks like I’ll need to spend some time with different forms of signal persistence. Can you explain why there is so much difference? I think it’s because a fractional difference model is even redder than a simple auto-regression model. There’s more power at the lowest frequencies. About half the proxies that passed the screen have an AR coefficient less than 0.1 and a difference factor more or less evenly distributed between 0.1 to 0.5. The fractional difference coefficient is related to the Hurst coefficient by d = H-0.5 . I need to do an ARMA (1,0) fit on the synthetic series to see how it compares. The next step is to generate a spectrum of synthetic series to match the range of the proxies. I’ve been doing some noise model fitting to the 1209 infilled proxies. An ARIMA(1,0,0) model isn’t really a very good general model. Adding MA, (1,0,1) produces a lot of significant large negative MA coefficients (between -0.1 and -1.0). IIRC, that’s a sign of improper model specification. 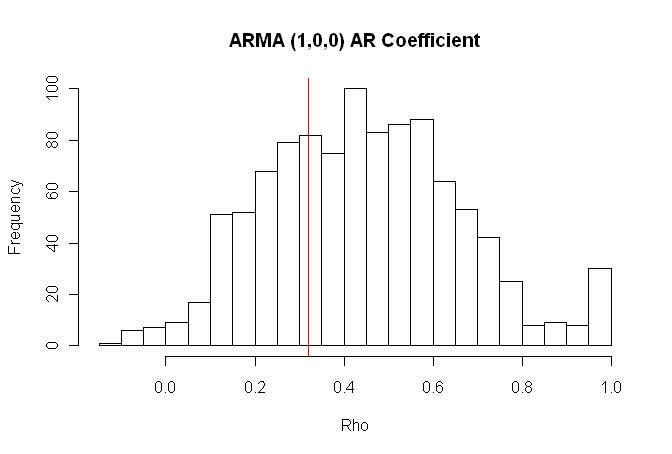 An ARFIMA (1,d,1) model, where d is in the range 0 – 0.5, shifts most of the MA coefficients to positive territory. Unfortunately, the armaFit function doesn’t do significance statistics on the coefficients. That would seem to make Mann’s test using AR(1) with rho = 0.32, not particularly enlightening. After a few false starts with the loop and array indexes, I created 1209 synthetic random series with the same parameters as the Mann infilled data with an ARFIMA (1,d,1) model. There were 4 series that returned AR coefficients greater than 1 and one with an AR coefficient less than -1. I set those coefficients to 0.999 and -0.999 so I wouldn’t see warnings about non-stationary series. I still get acceptance of 31% of the no signal series, i.e. a Hockey Stick. That’s after scaling all the series to a mean of zero and an sd of 1. I’ll have to try not scaling, but if I don’t scale, the average over all series is not zero. But then maybe it shouldn’t be. Adding the signal 1:1 with the noise, the acceptance was 80%. At a ratio of 5x noise to signal, the acceptance was about 40% with the usual behavior of squashing the ‘reconstructed’ sine wave signal relative to the calibration period.